The most striking example of Carer’s ability to conceive and design forklift trucks like a “tailor-made garment” based on each specific request from its customers is definitely fully expressed in the very important project commissioned to our company to design and develop two 7 t electrical vehicles to handle and store underground drums containing radioactive waste in France. The forklift trucks made by Carer have a fully sealed lead cabin fitted with oxygen cylinders for the operator. It is fully protected against any contamination deriving from the goods handled. After this important job, other firms operating in the radioactive waste sectors contacted Carer. 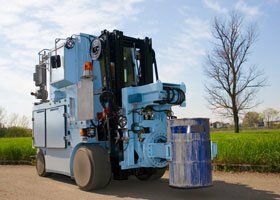 For processing needs that differed from the previous project, in 2013 two other very compact vehicles were built to handle and store steel boxes full of radioactive waste. The forklift trucks have various automatic systems and safety devices, including five infrared cameras to help the operator accurately store large radioactive containers in the dark.